The office of President was created by the constitution, Bunreacht na hÉireann after its ratification by the people in 1937. Douglas Hyde became Ireland's first President a year late, the first Irish Head of State not connected with the British monarchy. The office is an entirely ceremonial one - the President signs bills into law, receives official visitors and represents Ireland on state visits abroad. He or she must remain apolitical - party affiliations become moot once a candidate is elected to the office. If he or she chooses, the President can call a meeting of the Council of State to deliberate whether new bills are in keeping with the constitution. 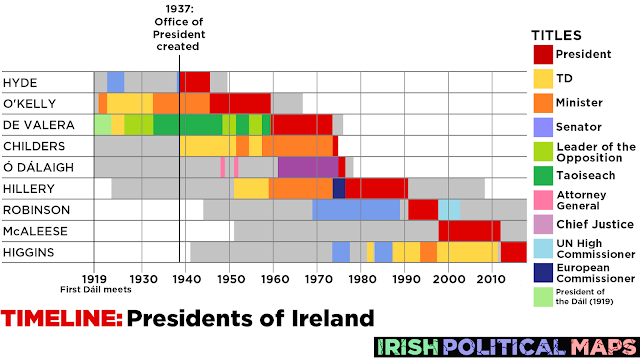 Below is a timeline, beginning with the establishment of the Oireachtas in 1919, showing the careers of the nine men and women to have been President of Ireland to date. Douglas Hyde was the oldest person to become President of Ireland, he was 78 when elected in 1938. Mary McAleese was the youngest, aged 46 when elected in 1997. Hyde, Cearbhall Ó Dálaigh and Patrick Hillery were never elected by popular vote. They were each nominated to the post unopposed by members of the Oireachtas. Seán T. O'Kelly and Mary McAleese were both elected to their second terms unopposed. Cearbhall Ó Dálaigh and Mary Robinson are the only Presidents to have resigned before their terms were complete. Ó Dálaigh resigned due to a disagreement with the Government, while Robinson resigned near the end of her term in order to take up the post of UN High Commissioner for Human Rights. Erskine Childers is the only President who died in office. He suffered a fatal heart attack after giving a speech at the Royal College of Physicians in Dublin on 17 November 1974. As a result, Childers had the shortest term as President (1 year, 5 months). Seán T. O'Kelly, Éamon de Valera, Patrick Hillery and Mary McAleese each served the maximum term length of 14 years (two 7 year terms). Mary Robinson became the first woman to be elected President in 1990. Seven years later, Mary McAleese became the first woman to succeed another as Head of State anywhere in the world. McAleese is the only President to have never held a political office beforehand. She did run in Dublin South East in the 1987 general election as a Fianna Fáil candidate, but was not elected. Éamon de Valera is the only Taoiseach to go on to become President. Mary Robinson is the only President to go on to hold another office after her term. She was UN High Commissioner for Human Rights from 1997 to 2002.